Thank you for your interest in volunteering at the Southampton Animal Shelter Foundation! We have many opportunities for volunteers to assist in helping out the animals at our shelter, from walking dogs, spending time with cats, assistance with laundry, help with special events and offsite adoption events, and more! It’s only with the support of volunteers that we can continue our mission to help more animals! 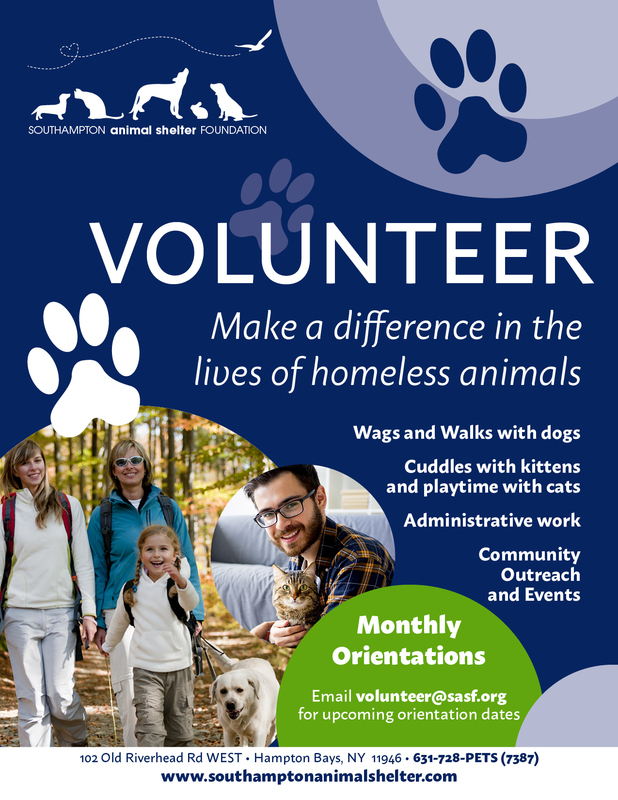 Prospective adult volunteers for all SASF programs are required to attend one of our volunteer orientations. There is a second Dog Walking Orientation that is mandatory for walking dogs. Specific program needs and volunteer opportunities will be explained at volunteer orientation. We request a $25 contribution at orientation for a volunteer T-shirt and to help defray the cost of administering the volunteer program, which leaves more resources available for care of the animals. We know there are many children in this age group who would love to work with the animals; unfortunately, we do not have the supervision to offer this as independent volunteer work. Children ages 10-14 years old may accompany the parent or legal guardian during their time volunteering after attending orientation. We ask that no more than two children accompany an adult at one time. For each child we request $10 to cover the cost of their volunteer t-shirt. When you fill out your application online (link below) you can sign up for the upcoming orientation dates available. The Southampton Animal Shelter Foundation Teen Volunteer Program is for 15-17 years old. Everyone attends the same orientation in order to become a volunteer. Attendance with a parent or legal guardian is required (to sign waivers and to learn about the rules and responsibilities). We also request a $25 contribution at orientation for a volunteer T-shirt and to help defray the cost of administering the volunteer program, which leaves more resources available for care of the animals. This will be collected at the orientation. *If you are a group or organization looking to volunteer, please call 631-728-PETS ext 237 for more information! Please note that court-mandated community service cannot be fulfilled through our volunteer department. Please call 631-728-7387 for more information. We had 300 active volunteers who donated almost 10,000 hours of service in 2017! It is volunteers that make SASF who we are. Our dedicated volunteers provide the love and workforce needed to help us save the amount of pets that we do, while treating each pet as an individual. Thank you so much for supporting SASF!